Before the renovation a considerable amount of apartments were vacant and the modernization of the roof, facades and balconies was imperative. The owner wanted to seize the opportunity to take several energy efficient measures in order to reach an economic optimum for himself and to safeguard stable rent prices for tenants. In the past it was possible for the variable energy cost to exceed rent prices. LUWOGE consult has examined the optimal renovation strategy reckoning with the existing parameters and comparing several technical variants. Only the economically most profitable option was accepted. This project stands out because its economical and social components relate to the ecological components: it is economically appealing to the project planner since the investments profitability has been optimized. The project also offers economical benefits for the tenants as heating costs will be included in the total rent price and electricity is produced by solar panels. Moreover, the social impact of the renovation works was rather limited: because the works mainly relate to the exterior building the occupants did not have to leave their homes. This project demonstrates that the economically most profitable solution can simultaneously be the best option form an energetic perspective, provided that the situation is properly analyzed. The exterior facades, the roof and the basement ceiling were provided with insulation layers of 30 cm, 50 cm and 15 cm respectively. The thermal bridges at the existing balconies were eliminated by the integration of the balconies into the building shell. 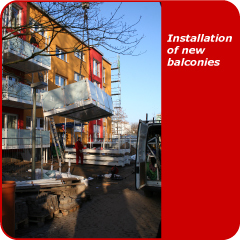 The new balconies are supported by a new independent construction. A system of balance ventilation with heat recovery was installed and its supply ducts were positioned on the outside and integrated into the façade insulation package. Top-hinged windows allow nocturnal ventilation in the summer period. Heating is assured by the system of balance ventilation with heat recovery. The incoming air is preheated by means of an underground heat exchanger. The rooms receive additional warming from window heating, the necessary energy of which is produced by photovoltaic cells. Sanitary hot water is heated through solar collectors. While choosing the insulation material the owners took into account both the environmental and the economical effects of a particular material during its total life span. They opted for a new type of expanded polystyrene (EPS) with graphite, which is 100% recyclable. Initially the window heating gave rise to a number problems because certain occupants kept the window heating activated while a window was open. They also noticed that consumption increased when the systems were not optimally tuned. It is therefore essential to ensure proper system tuning and sufficient occupant sensitization.